Want to know what our local candidates think about human services and social justice issues? Join us for a face-to-face opportunity with Seattle and King County candidates! Sign language and language interpretation and child care services available upon request with RSVP. DON’T FORGET TO VOTE ON NOVEMBER 5TH! 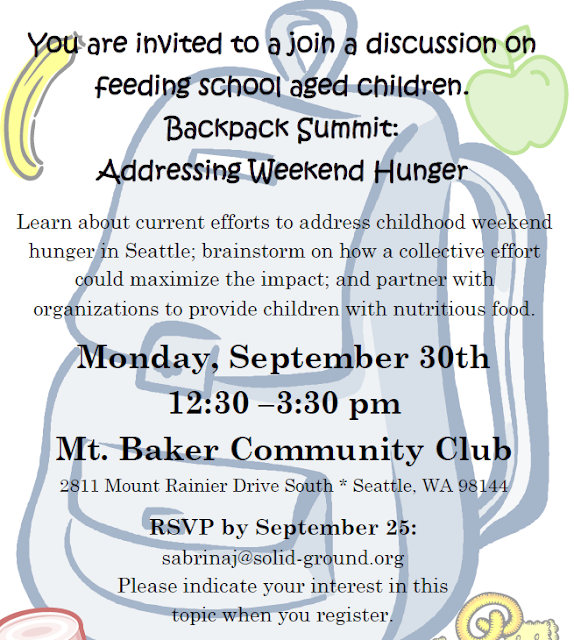 The Seattle Food Committee will be hosting a Backpack Summit on Monday, September 30. Join us as we brainstorm how a collective effort could maximize the impact to end childhood weekend hunger! RSVP to Sabrina at sabrinaj@solid-ground.org.